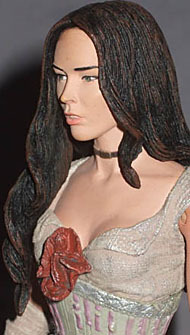 It's fair to say Megan Fox hasn't had a good run in the action figure industry - prior to the Jonah Hex line she'd had a grand total of three, which is actually fairly prolific for a relative newcomer, but of those three, only one featured joints, and only none of them looked anything like her. And - let's be honest here - if she didn't have looks that suggest someone's cloned Jennifer Connelly (at last), the cons of Megan start to outweigh the pros. Luckily, as I've noted before, when you buy an action figure you don't have to put up with its personality. If you already bought Lilah and are wondering where we pulled that bio from, it's not a "Wikipedia special" - it comes straight from her packaging, though you might have missed it (we nearly did). With the back of the paper insert given over to the presumably studio-mandated advert for Jonah Hex motion comics, NECA chose to print the individualized info on the side of the packaging, where it's easy to overlook. Lilah here was more or less created whole-cloth for the movie - comic fans got thrown a bone with her real name being Tallulah Black, after one of the comic's supporting cast, but whether she's "really" Tallulah is debatable - but there's probably a significant market for Megan Fox In Lingerie regardless of who she's pretending to be, so perhaps NECA knew what they were about ignoring the biographical details. By now I'm sure anyone with an interest in Ms. Fox has downloaded and insert-euphamism-here'd over the photos of her swanning around in her Lilah get-up, so the costume shouldn't be a surprise - although if you haven't seen the movie, you may be wondering why her ensemble is all white, rather than the black version Google image search has the hots for; the figure is movie-accurate, it just seems she's got different versions of the same dress. Business must be really good for Lilah in the old west - not that there weren't fortunes being dug up and handed over to the nearest bawd all over the frontier, but she does seem like she'd be more likely to hail from a big place convenient to San Francisco than some two-bit silver town like the movie's Stunk Crick (not a typo, believe it or not). Of course, this is Hollywood's version of the frontier, where it's par for the course for the doves loitering around the saloon to have prettier faces, finer wardrobes, and less syphilis than you'd expect. To boil it down, this figure needs two elements: Megan Fox's hot body, and the prospector-bait outfit it's been poured into; luckily NECA has a good track record with physique and clothing, and it just takes a glance to see they haven't dropped the ball. The biceps are a bit on the scrawny side, but sadly that's accurate - her thighs make up for it, and the matching between cast skintone and painted skintone is pretty close (helped by the sections all being bordered off by the outfit). As per usual everything that's not skin has texture all over it - weave for the dress, boning for the corset (fine sculpted lines, as well as the larger stripes the paint picks out), gentle ripples in the stockings around the knees, and two textures for the boots, shiny for the foot, and rougher leather on the upper parts. The paintwork is precise (aside from one tiny bit of grey slop on the rose pinned to the bodice), but muted - there aren't any strong, pure colours, which fits the wild west aesthetic well. The big showpiece, costume-wise, is the dress from the waist down - the exposed bodice, above the corset, is just painted, as is the tiny bit of skirt making a last-ditch attempt to preserve Megan's modesty beneath the waist, but the actual waist-to-ankle element is a very well-conceived use of semi-transparent soft plastic, a glittery gel mix of some kind, with a frosting of paint applied over the top (like Mrs. Claus) to give the texture definition, pick out the sharp creases to make the "fabric" look more like full-size material, and lessen the transparency enough that it matches the opaque sections. Both the black stockings and Megan's bare thighs above show through the folds of the dress - especially in back, so you don't even have to look like a perv tilting her over to see that she is indeed wearing some of action-figuredom's most skimpy underwear (not quite at Castlevania Succubus level, but still). She's fully detailed beneath the dress, but it's pegged in at multiple points around the hips, so if you're thinking of modifying a figure to have your own g-string-sporting Megan doll, be prepared to put in some time patching and repainting in the process. So far as likeness goes, she does look quite a bit like Megan Fox - a hell of a lot more than any of the Transformers efforts, but those weren't exactly 1:6-scale replicas, so they can be forgiven a lot. NECA holds itself to higher standards, and pretty much delivers - I'm not 100% sure of the tilt of her nose, but she's pretty specifically Megan. The paint is simple - just eyes, brows and mouth, no blush or eye shadow - but very exact, even to the little flash of teeth behind her slightly-parted lips. Her hair gets a fairly standard dark-base/medium-highlight brunette effect, which works well enough with the sharp sculpt. She's pretty immobile, no question, but there are a few more axes of motion than you'd expect, so at least some credit has to be given for effort in articulation. The obvious joints are the balljoint neck, swivel/pin shoulders, and swivel wrists - looking at her, you'd expect elbows, thighs, waist, and maybe boot tops. Well, she has all those - but the elbows are actually shallow balljoints, ditto the boot tops and the waist. She still won't be winning any mobility awards - the elbow and ankle balls are really shallow, little more than "slight tilt" in their two non-swivel axes - but within the bounds of the one pose she's got (well, two, if you include raising her arm to aim) there's a lot of room for tweaking to get her just right. 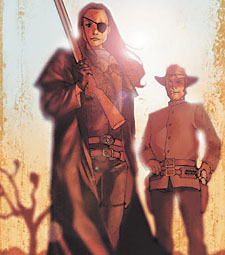 She has one accessory, a little pocket pistol - a very likely accessory for a well-off prostitute on the frontier, regardless of whether she's appearing in an action movie. It's a very simple piece, painted heavily silver with brown for the wooden sides of the grip, and fits well enough - though not as tightly as it might - into her right hand. The sculpted grip gives it a bit of an inward and downward tilt, but with the elbow joint that can be accounted for to get her looking down the barrel. She doesn't have a base, which is a bit of a shame - both feet have peg holes, and although she can stand on her own, her balance is a bit precarious, depending on how you position the thigh and ankle joints. As a representation of the movie character, I really can't comment on this figure - then again, from what I hear Jonah Hex isn't going to go down in history as one of the comicbook film greats, so it makes more sense to just take her as she is: desk decoration. She looks good, face and body, the clothes are well presented, the lower dress being especially noteworthy, and her handful of joints are welcome, if not particularly ambitious. If not for the dress I'd just call her yet another half-dressed female figure - even with males still dominating the merchandise shelves, collectors aren't short of eye candy - but the semi-transparent effect of the plastic and paintwork gives her an edge that merits a second glance if you're thinking of buying.